CARFAX Certified 1 Owner - No Accidents - Fully Serviced - QUALITY CERTIFIED up to 10 YEARS 100,000 MILE WARRANTY Thank you for your interest in one of Quality Auto Center's online offerings. 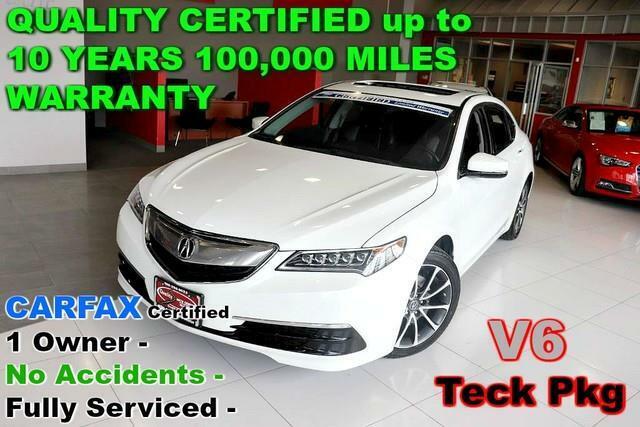 Please continue for more information regarding this 2015 Acura TLX V6 Tech - CARFAX Certified 1 Owner - No Accidents - Fully Serviced - QUALITY CERTIFIED up to 10 YEARS 100,000 MILE WARRANTY with 36,653mi. CARFAX shows that this is a one-owner vehicle -- no wonder it's in such great condition. It's not often you find just the vehicle you are looking for AND with low mileage. This is your chance to take home a gently used and barely driven Acura TLX. Added comfort with contemporary style is the leather interior to heighten the quality and craftsmanship for the Acura TLX The Acura TLX V6 Tech - CARFAX Certified 1 Owner - No Accidents - Fully Serviced - QUALITY CERTIFIED up to 10 YEARS 100,000 MILE WARRANTY has a navigation system installed, so you'll always know where you're going. This top-tier navigation system is reliable and will get you to your destination quickly and by the most efficient route available. The easiest choice in purchasing a new vehicle is choosing one with a complete and detailed history like this gently driven pre-owned vehicle. Pre-owned doesn't have to mean used. The clean interior of this Acura TLX makes it one of the nicest you'll find. Look good driving this beautiful vehicle and feel good knowing it comes with a factory warranty. If you're looking for world-class speed, acceleration, cornering and handling, don't blink because you'll miss this truly amazing automobile. You demand the best in everything, so why would your automobile be any different? Enjoy the best features available in this stunning Acura TLX. The paint on this car has no serious defects, blemishes, scratches or scrapes. One look is all it takes to know what a find this 2015 Acura TLX V6 Tech - CARFAX Certified 1 Owner - No Accidents - Fully Serviced - QUALITY CERTIFIED up to 10 YEARS 100,000 MILE WARRANTY is. The upgraded wheels on this vehicle offer improved handling and an attractive appearance. More information about the 2015 Acura TLX: With a base price far more in line with the outgoing TSX than with the outgoing, but upmarket TL, the new TLX represents an excellent value. Competitors include the Lexus ES350, the Mercedes-Benz CLS, the Audi A4 and the BMW 3-series. With a base price that starts just below $31,000, the TLX undercuts many of its rivals, while still offering plenty of space, sophisticated drivetrains and a modern chassis. This model sets itself apart with available all-wheel drive, good fuel economy, advanced transmission options, and Good balance between luxury and sportiness No Credit / Bad Credit / No Paystubs, No problem !! ! All Approved ! Everyone drives ! CLEAN, GORGEOUS, LOW MILES, SHOWROOM CONDITION. CALL NOW QUALITY CERTIFIED up to 10 YEARS 100,000 MILE WARRANTY , To Certify a vehicle, there will be an additional cost for Certification. CALL NOW For details. STUNNING AGGRESSIVE LOOK ON THIS BEAUTIFUL--Call today to schedule a test drive... Good Credit/Bad Credit/No problem!!!! Get paid cash? No problem!! 100% Credit Approval with interest rates starting at 2.49% for qualified customers, our rates will not be beaten. We price our cars at wholesale price to guarantee the best deals for our customers. Our inventory moves quick, please call to confirm the availability of the vehicle of your interest Springfield location 973-564-0112. This vehicle is located at our SPRINGFIELD location. Come visit our new showroom in Springfield NJ. This outstanding example of a 2015 Acura TLX V6 Tech is offered by Quality Auto Center. One of the best things about this Acura TLX is that it has low, low mileage. It's ready for you to truly break it in. The quintessential Acura -- This Acura TLX V6 Tech speaks volumes about its owner, about uncompromising individuality, a passion for driving and standards far above the ordinary. The look is unmistakably Acura, the smooth contours and cutting-edge technology of this Acura TLX V6 Tech will definitely turn heads. More information about the 2015 Acura TLX: With a base price far more in line with the outgoing TSX than with the outgoing, but upmarket TL, the new TLX represents an excellent value. Competitors include the Lexus ES350, the Mercedes-Benz CLS, the Audi A4 and the BMW 3-series. With a base price that starts just below $31,000, the TLX undercuts many of its rivals, while still offering plenty of space, sophisticated drivetrains and a modern chassis. This model sets itself apart with available all-wheel drive, good fuel economy, advanced transmission options, and Good balance between luxury and sportiness No Credit / Bad Credit / No Paystubs, No problem !! ! All Approved ! Everyone drives ! CLEAN, GORGEOUS, LOW MILES, SHOWROOM CONDITION. CALL NOW QUALITY CERTIFIED up to 10 YEARS 100,000 MILE WARRANTY , To Certify a vehicle, there will be an additional cost for Certification. CALL NOW For details. STUNNING AGGRESSIVE LOOK ON THIS BEAUTIFUL--Call today to schedule a test drive... Good Credit/Bad Credit/No problem!!!! Get paid cash? No problem!! 100% Credit Approval with interest rates starting at 2.49% for qualified customers, our rates will not be beaten. We price our cars at wholesale price to guarantee the best deals for our customers. Our inventory moves quick, please call to confirm the availability of the vehicle of your interest Springfield location 973-564-0112. This vehicle is located at our SPRINGFIELD location. Come visit our new showroom in Springfield NJ.